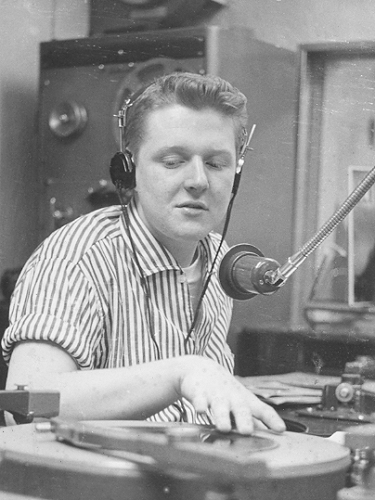 During his lifetime, legendary deejay Red Robinson, who still hosts Red Robinson’s Red Rock Diner of radio station 104.9 Fun FM on Canada’s west coast in Vancouver, forged friendships with Roy Orbison, Johnny Cash and many others that spanned decades and he spent considerable time and became friends with people such as Buddy Holly, Bobby Darin and Elvis. He was instrumental in bringing Elvis to Canada for his first concert and John Lennon tried to curse him off the stage during The Beatles’ concert, due to a misunderstanding. During a dark time in Canadian history, not often acknowledged by Canadians, Red Robinson had to literally smuggle the music of African American artists out of record stores, because prejudice was more widespread than many Canadians would like to admit. He played that music on the radio at a time when it was not popular to do so. It may surprise many readers to learn that there were disc jockeys who were playing Rock and Roll music before Wolfman Jack, there names were Alan Freed, Tommy Edwards (WERE, Cleveland, OH) and Red Robinson. “In ’95 they elected us to the Rock and Roll Hall of Fame, but in ’97 R&R Magazine had us there and they had a special presentation that was called Dedicated To The One I Love. All of us originals were there, Arnie Woo Woo Ginsburg (WBOS and WBEX, Boston), myself, Cousin Brucie Morrow (WABC, New York City), the early guys and gals of Rock and Roll, the deejays. We started this thing on the airwaves and if it wasn’t for us and certain movies that were made in that time, Blackboard Jungle with “Rock Around The Clock,” on the soundtrack, it never would have happened. When Bill Haley was here in 1956 and when I was interviewing him I said, Bill you have to be on top of the world, look at all the hits that you have had. You are huge in North America and you are big in London England. You are driving everybody crazy. He said, ‘No, it is all over for us. I give us another year.’ I said what are you talking about? He said there is this young good looking guy out of Memphis, Tennessee and they call him the hillbilly cat, Elvis Presley. He is good looking and he has a great presentation and he is going to take over. (Robinson laughs and says) Haley had vision. He had been around. He knew. At the time he was thirty-five or thirty-six. He knew,” says Robinson. Back on that day in November of 1954 when Red Robinson first took to the airwaves the very first song that he played was “Marie,” by The Four Tunes and he wants our readers to know that even though he was a teenager at the time, “Absolutely (I picked it out). In my time, we didn’t have people picking our shows, we did it. If you got ratings and sponsors followed, you kept your job. If you didn’t you were thrown out on the street. I’ve got news for you, I like that and I would like to see more of it today. We would have more entertaining radio and we would have more personality on the air, because you had to work at it. If it wasn’t for us playing the music, these people (the artists) would never have become prominent. Buddy Holly would spend time with me, because he wanted to promote his records. When Paul Anka went on the Show of Stars tour with Buddy Holly, The Everly Brothers and everybody, they came to Vancouver and they played the old Denman Auditorium. The difference in that day was, when the show was over at ten o’clock at night, the deejays, myself and the guys who were on the show, would go down to the corner to a restaurant called the What Spot and we had hamburgers. Can you imagine doing this with Shania Twain today? It was a wonderful era, because we were all friends. When we would bump into these people it was just like old home week,” he recalls. Robinson refers to that time as the era when Rock and Roll began to emerge from two musical styles, Rhythm and Blues and Rockabilly, which he describes as being more a country swing and the type of music where Bill Haley began his career. Robinson believes that early rock and rollers took inspiration from people such as Bob Wills and Hank Williams. “If you listen to some of Hank Williams stuff, my God they stole lines out of it,” he says. In an age when the internet did not exist and personal computers were unheard of, those in the music business relied on telephone and mail to disseminate information. Red Robinson had to be creative, so he could keep abreast of the cutting edge music. He would often put in phone calls to Stark Records, a store in Bellingham Washington or he would ask his friends to pick up “new” music for him that appeared in the stores in nearby Washington State, to ensure that he kept up with both his Canadian counterparts in eastern Canada and American deejays. It was Red Robinson’s flair for identifying new talent and good music that caught the attention of the management and the owner for television station KGW in Portland Oregon, which at the time was owned by King Broadcasting and who also had KFSO and KING radio stations in San Francisco and Seattle respectively. “I went down there and when I left (Vancouver) I had a fifty percent rating. Fifty percent of the people who had the radio on were listening to me. Why would I give it up? I wanted television experience. In January of 1959 she (the owner) hired me and I went to Portland. Part of the deal was that I would do a disc jockey show every afternoon and I would do a television show Portland Bandstand, like American Bandstand and I got some television experience out of it. When (the artists) would come into town we would have them come on. In one particular case Bobby Darin appeared on my radio show, which was being broadcast from the fair grounds in the summer of 1959. We had all of these stages set up, Bobby came by and I handed him a microphone and a headset and I said, you are my disc jockey now and I will be in the background to help you. The incredible part was he would play Ray Charles and he would sing along with Ray and then he would do impersonations of Jack Benny. It was just Darin being Darin and it was an amazing performance for about eight minutes,” he recalls. Colonel Tom Parker handpicked Red Robinson to emcee the Elvis concert in Vancouver, because Robinson had headed up a group of people who had tried to bring Elvis to the city earlier, but that was put on hold until there was tour nearby. 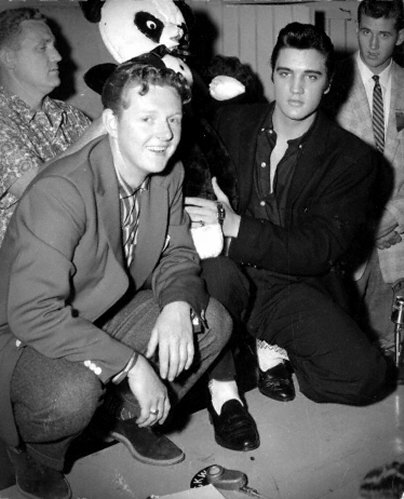 As a result, Robinson got to spend a bit of time with Elvis as well. “Elvis was just like a guy that I had gone to school with. There was no pretense and no conceit. He wanted to look good, but he had no conceit. He was just like a school buddy. We talked about cars, girls and movies and stuff that young guys talk about. It was humble beginnings for him and for most of us right after the war,” he says. When asked if he had ever envisioned a day when he and other radio broadcasters would be selected and honored by the Rock and Roll Hall of Fame, Red Robinson replied, “No and first of all we never thought there would be a hall of fame for Rock and Roll, because I had it thrown at me that it was the evil “n” word music. I had that thrown at me when I was a kid. Imagine taking that. In Canada we are smug and we think that we didn’t have those prejudices. In my book Backstage Vancouver, written with Greg Potter (there is a photo) of Louis “Satchmo” Armstrong sitting on his luggage outside a Vancouver hotel, because they wouldn’t let him stay there. 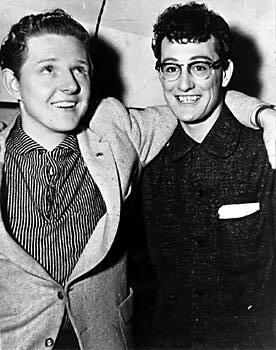 A lot of us didn’t think Rock and Roll would last and if you get hold of my Buddy Holly interview from October of 1957 I asked Buddy, how long do you think Rock and Roll will last? He said, ‘Maybe until Christmas, not much after Red.’ We were all having a ball and we were enjoying it, but we didn’t think that it was going to last. Who would have ever have envisioned a museum and a hall set aside to honor Rock and Roll. Photos top to bottom: # 1 Red Robinson on air 1955 at CJOR, #2 Red Robinson with Elvis, #3 Red Robinson with Buddy Holly.